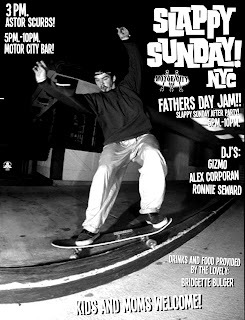 Here we go again on another fabulous celebration for Go Skateboarding day with the Already Famous crew this Friday June 22nd from 5pm-9pm don't miss out. 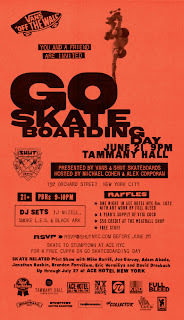 It's that time again to skate all day and rock out all night, Join Me and Michael Cohen for drinks, prizes and great music celebrating Go Skate Boarding day at Tammany Hall 9pm-4am. ON THE SET OF "KIDS"
This was the golden age of skating in NY.... Here we are on the set of the movie KiDs getting ready to film the Washington Square park scene. 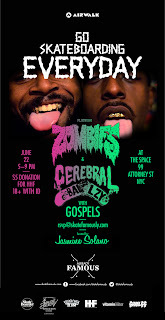 The posse was in Full effect. in this photo: Frank Natiello, Alex Corporan, Joey Alverez, Mike Hernandez, Jeff Simmons, Justin Pierce, Nuri Bell, Lil Nick, Hamilton Harris, Peter Bici, Jefferson Pang, Medwin Pang, Harold Hunter, Ryan Sikorski and Jamie Story.